On the most arrested NFL teams in the past 5yr. The 49ers dominated Seattle 12 to 9. Although our sports stars get arrested at rates far less than the general population, I believe they need to be held to a higher standar, particularly since kids look up to and emulate them, and because their actions can hurt their teams. Although he didn't get arrested, linebacker I.K. Enemkpali was released by the Jets today after he allegedly sucker-punched starting quarterback Geno Smith, who will now be out 6 to 10 weeks with a broken jaw. I don't get what it is with these guys and fights at training camp. Cam Newton got into it with a team mate yesterday, this idiot on the Jets takes out their own QB....maybe it some bizarre rite of passage or something before they can become a "team" for the regular season run. Many forget its a violent sport with emotions and testosterone running high. I see the fights as part of the game and can even remember a fight or two amongst teammates when I played HS ball. That I get... Heck look at hockey or baseball which have fights all the time. Well...look at the charts on the attached story and compare NFL Players vs U.S. Average...you might be surprised...and these stats do NOT include the NBA..
That chart compares NFL to arrested individuals. A more accurate picture would be if we compared NFL arrests to those of other adult males. 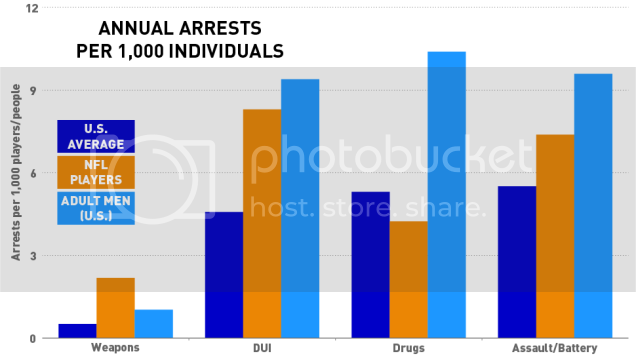 Yes, NFL players get arrested more than women and children, but less than other men. Likewise, there was an article last year that showed that about 4.25% of adult men were arrested in a given year, but only 1.92% of NBA players. I think that's important because some people are getting the image of NFL and NBA players as a bunch of criminals, when in reality, most are law-abiding citizens and college graduates. Perfect...I knew the Raiders would get back to doing what they do best...employing criminals.